Muslim weddings have a place of their own when it comes to uniqueness and traditionalism. Among Muslims, it is the family of the groom-to-be which searches for a suitable bride. This ceremony is the inaugural ritual of a Muslim wedding, which is held at the home of the bride on the eve of the wedding ceremony. Mehndi is the artistic drawing in Henna of patterns and flowers on the hands and feet (and nowadays the neck) of the bride and the other ladies. Female relatives of the would-be bride or a professional mehndiwaali applies mehndi to the palms and feet of the girl. Also, the female relatives of the girl anoint the girl with haldi or turmeric paste to bring out a glow in her complexion. According to the tradition, the girl hereafter is forbidden to step out of her home until she gets married. The event has a festive feel to it with the women singing traditional songs. The bride wears sober clothes. The bride's cousins sometimes apply a dot of mehndi on the palm of the groom. Common to all wedding ceremonies, the groom arrives with his friends and relatives and a group of musicians at the wedding venue with the groom seated on a horse or in a car. On arrival, the groom and the brother of the bride exchange a glass of sherbet. Throughout the ceremony, the bride's sisters welcome the guests from the groom's side by playfully teasing them good humouredly. It is customary for the boy's family to send the wedding attire, jewellery and cosmetics for the girl. She usually wears the outfit as per the norms of the state she hails from for instance a gharar or a zari sari or salwar kameez. The dupatta covers her head. While the groom typically looks good in a sherwani and a topi that covers his head. Both the bride and the groom don a sehra or a veil of flowers around their foreheads. Nikaah symbolizes the actual wedding ceremony, the venue for which can be groom's house or the bride's, as per convenience. Traditionally, the men and women have to be seated in separate rooms or have a purdah (or curtain) separating them. The 'Walis' (the father of the bride and of the groom) play an important role in the ceremony. It is on the day of the Nikaah that the elder members of the two families decide the amount of Mehar (nuptial gift that is a compulsory amount of money to be given by the groom's family to the bride's.) 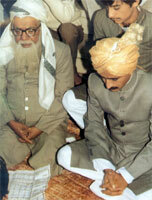 The ceremony is directed by a Maulavi (priest), who reads quatrains from the Holy Quraan. Prior to this, the consent from both the would-be life mates is seeked by reading aloud a document called Nikaahnama, a document wherein the marriage is registered. First, the groom and the two witnesses sign it, and later the bride does so. In south India, the bride gets a 'lachha' (a necklace, similar in concept to a mangalsutra) from the groom. Whereas in the north, she gets a nose ring. This is followed by the Maulavi reading the verses from 'Agadh-a-Nikaah' which symbolizes the grant of religious approval to the wedding. The boy and the girl are hereafter deemed as 'married' to each other. After the Nikaah the groom receives blessings from the older women and offers them his salaam. The guests pray for the newly-weds. The cardinal ceremony of Nikaah being over, a festive dinner is served, which is very prodigal and extravagant. Dinner is served separately to the ladies and the gentlemen. Their heads are covered by a dupatta (traditional scarf) while they read prayers under the direction of the maulvi (priest). The Quran is placed between the couple and they are allowed to see each other only through mirrors (aarsi). Thereafter, the bride's relatives bid her a goodbye as she now leaves her parents and her home for a new home and a new life.